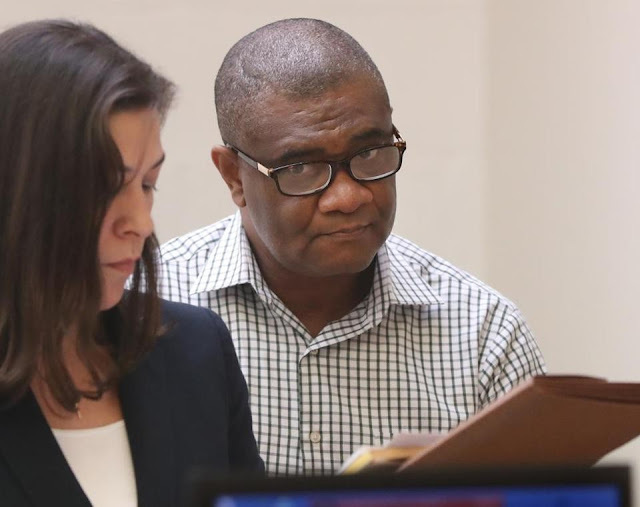 The Archdiocese of Boston has removed a Nigerian priest residing at a Massachusetts church from ministry after an allegation that he sexually abused a child, the archdiocese said in Tuesday. Rev. Christian Ohazulume, an extern priest, who has resided at St. Mary of the Assumption Parish in Brookline, pleaded not guilty to three counts of aggravated assault and battery on a child under 14 in Quincy District Court on Tuesday, September 11, according to Norfolk District Attorney Michael W. Morrissey. The Archdiocese received an allegation on August 31, against Rev. Ohazulume, from Nnewi. The incident allegedly happened in Randolph in 2007, while he was living with his uncle after he arrived in the United States. The then 8-year-old victim's father says that Ohazulume is his own nephew, and that he helped bring him to the U.S. from Nigeria to study at Boston College. "I'm sad," the man said in an exclusive interview with NBC10 Boston. "I'm devastated." The girl recently told police Ohazulume touched her inappropriately and kissed her. The alleged crimes happened in the basement where Ohazulume lived with the family when he first moved to the U.S.
"I don't think my daughter would make up anything like this knowing how Father Christian is a family member," the man said. He added that he knew nothing of the allegations until his daughter spoke up recently. "I invested in Father Christian coming to this country," the girl's father said. "I helped him in many ways. Like a son." Ohazulume was ordered held on $5,000 bail. The assistant district attorney requested he not be allowed to travel outside of Massachusetts, that he have no unsupervised contact with any minors, that he stay away from and have no contact with the victim or her family, and that he be subject to GPS monitoring if released. Ohazulume has assisted in celebrating Mass and hearing confessions at St. Mary of the Assumption Parish since 2010. He has also been employed as a chaplain at Beth Israel Deaconess Medical Center since the same year. The hospital says he has now been fired. "When the Archdiocese informed us about the allegation and it's decision to revoke Rev. Ohazulume's ministry faculties, we immediately praised him on unpaid leave and terminated him shortly thereafter. He is no longer employed by BIDMC, " the hospital said. The allegation of sexual abuse reportedly occurred in Randolph in 2007, when Ohazulume was living with a family after arriving in the U.S. The archdiocese said it learned of the allegation on Aug. 31 and immediately notified law enforcement. According to the archdiocese, it has been in contact with Ohazulume's home diocese in Nigeria and notified them of the allegation. As a result, his faculties to minister have been withdrawn. Ohazulume was represented at the arraignment by defense attorney Bethany Rogers. She denied the allegations and said Ohazulume was cooperating with the investigation. He is due back in court Nov. 13 for a probable cause hearing. The archdiocese said in a statement it is "committed to ensuring the safety and well-being of children and young people in our parishes and institutions." They said they continue to make counseling services available to survivors and their families impacted by clergy sexual abuse.